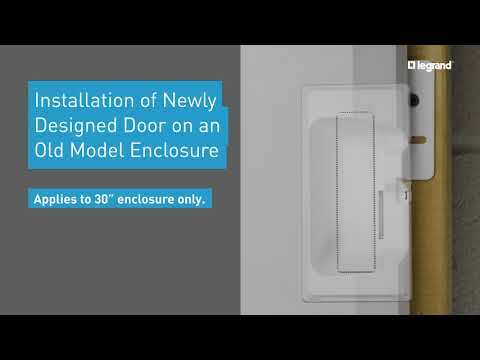 The enclosure mounts easily for both surface and recessed applications,to secure equipment professionally and out-of-sight. Click here to learn more about the unique features that will save you time and simplify installation. Cover includes metal hinge that attaches to left or right side of enclosure in seconds. Will your 48845CC6 fit on here? Hello, No it will not. That unit is meant to mount into a typical 19in rack mount space. It will not fit into the enclosure. Thank you. What are the dimensions (distances between adjacent holes) of the &quot;Universal Mounting Grid&quot;? I cannot find any related CAD drawing fort it. This is not an answer, but rather a request for clarification to the previously posted answer... The drawing shows the door, but I need the other part (the base?) where the door is attached. One of the features of &quot;the base&quot; is &quot;Universal Mounting Grid&quot; and it has 4 vertical rows of mounting holes. So I need CAD drawing for that base part. Are there alternative ways of mounting &quot;devices&quot; in the inclosure without using mounting brackets? The device that I have in mind has 2 mounting holes that you normally use with screws, slightly sticking out from the wall. Hello, We do not provide alternative methods of mounting devices. The enclosure is designed to mount On-Q product which uses a variety mounting brackets that are spaced and designed to mount into the enclosur . It's certainly possible to mount alternate or third party product using screws and we do carry some universal mounting brackets meant to hold modems and other third party units with Velcro but other than that, it's not a generally supported application. Thank you. What size screws should be used to mount the door? My package did not come with the door mount screws. Hello, For the hinged door, it would be the 6-32x .375 pan head screw. These screws are generally bigger than the holes on the enclosure but this is normal as these are cut screws that will cut into the metal of the enclosure along with the paint to hold the cover on properly. This is a UL requirement. Thank you. Will this unit fit between standard 2&quot; x 4&quot; studs? Hello, The unit is designed to go in between 16inch on center studs. So the width of the unit is 14 inches. As long as the spacing is correct, it should fit. Thank you. Will the On-Q AC1015 work with this cabinet? I'm looking for some sort of RJ45 patch panel inside the cabinet. Also looking for a full width shelf..... prefer not to make something. Hello, Yes, the AC1015 will work with all of our Non-MDU plastic enclosures. Including the one you listed. Thank you. The previous person asked about mounting modem, etc inside enclosure.Tech support answered &quot;putting a devices in here with wifi signal will severely reduce your range and strength. ? Marketing materials state &quot;Constructed of Wi-Fi transparent plastic&quot; ? Hello, I do apologize for the confusion. Mounting a wireless device into the plastic enclosure WILL NOT affect the signal range of the device. The Plastic enclosure is specifically designed to work with wireless devices. Only our metal enclosures would suffer from that issue. Thanks. How do mount modem, router etc inside enclosure? Are there racks avaialble.